AEROMARK is an officially licenced manufacturer of Notary Public stamps & seals in the the State of California. We manufacturer a variety of stamp and seal types daily and can ship to you if you wish. We do not, at this time, have the ability to manufacture stamps or seals for States other than California. All items may be ordered by Fax (714) 447-9131 or email aerostamps@aol.com. For additional information or questions, call (800) 447-9668.  Fast Service is our specialty! New! - Need a notary stamp in a smaller size? Thanks to new laser sharp dies & the crisp new Ideal pads, we can now make a notary stamp that is clearly legable in a smaller size while retaining clarity. This compact self-inking notary stamp has an impression of only 5/8" x 1 7/8". 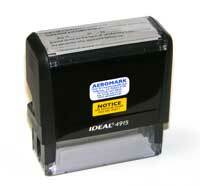 The new Ideal 4912 Compact Notary sells for $24.00. New! 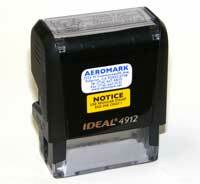 - This new California specific Jurat stamp is a self-inking model that makes laser sharp clear impressions. We make them on the sturdy Ideal 4915 case with an impression size that is 15/16" x 2 5/8". Bargain priced at only $21.00 each! The far and away favorite notary stamp is the Ideal 4913. The impression size is 3/4" x 2 1/4". Just push the top down and this terrific stamp makes a laser sharp clean impression every time. 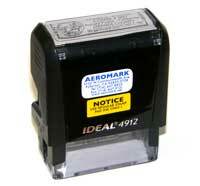 All the Ideal stamps re-ink easily with Ideal Stamp Ink. This great stamp sells for $24.00.